Chalet Chardon Bleu is an original Savoyard farmhouse, completely refurbished whilst preserving authentic features such as the old beams, the vaulted dining rooms and the open log-fireplace. Decorated with mountain charm, you will be able to relax in home-from home luxury. We offer 2 separate lounges. Our main lounge is spacious with comfortable sofas and armchairs that surround a real log fire. Entertainment includes satellite TV, DVD player, iPod player, Guest Computer, Games, books and WiFi. The chalets also offers a separate games room with toys, games, books and a Wii with a range of games. Outside of school holidays this doubles as quiet reading room for those looking for a place to chill. The dining room is in the converted ecurie; a magnificent room with vaulted ceilings. The morning sun filters in through the French windows and during the evening the lighting creates a warm and convivial atmosphere. There are currently 8 en-suite bedrooms available. 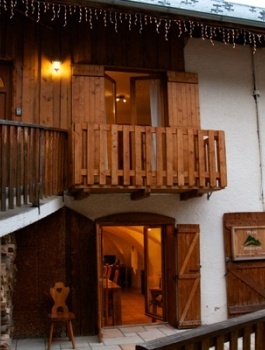 At full capacity the chalet can accommodate 27 people, however, 16 is more usual number. The rooms are very spacious and are a combination of Doubles, Twins, Triples, Quads and one large room for 6. All of our rooms are much larger than standard chalet rooms and offer plenty of space for storing ski gear. All of the bedrooms are en-suite and each has been individually decorated to reflect either the charm of the local area, such as the Tarantaise room, Vanoise or the exciting Moulin Rouge room. The chalet also boasts a stunning terrace with a sunken hot tub and mountain views. The perfect place for a beer / vino after a hard day on the slopes. Downstairs we have a separate area for storing skis / boards and a heated boot room.